It’s meals like this that help me get through the working week. 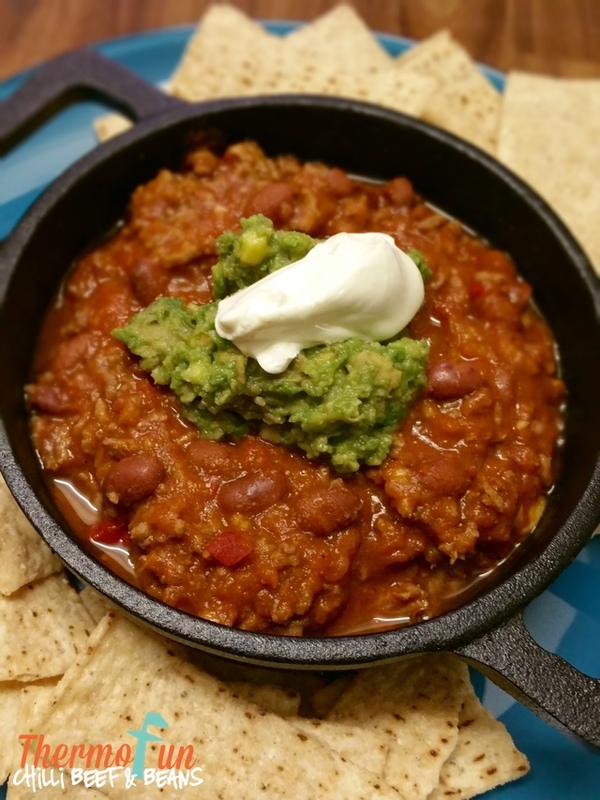 It wasn’t until I got my Thermomix that I realised how versatile this recipe is! I trust your family will enjoy this versatile recipe too! I converted this recipe from an old Woolworths Fresh magazine to be made in the Thermomix. Make ThermoFun Taco Seasoning and set aside. Place garlic, chilli, onions and oil into TM bowl and chop 3 sec / speed 5. Add taco seasoning, brown sugar, tomato paste, tomatoes and red kidney beans. Wet and squeeze some baking paper and lay it flat onto Varoma tray ensuring not to cover all the holes. Crumble mince onto baking paper and place assembled Varoma onto TM lid and cook 15 mins / Varoma / speed 1 / Reverse. Pour off any fat/moisture from the mince then break up mince on Varoma tray with aid of spatula. Tip mince into TM bowl and coat with mixture. Cook a further 5 mins / 100°C / speed 1 / Reverse. Serve in bowls and top with guacamole and sour cream. The corn chips are fun for dipping! You can halve this recipe and cook your mince in the simmering basket rather than in the Varoma. Hiya – do you add the entire amount of Taco Seasoning that the recipe makes? Easy and quick to make and my teenagers will eat it ! Could this be made with some sort of diced beef, to give it a soft, shredded beef type texture? (I had an old recipe that you pulled the beef apart with forks and it was magnificent). If so, how long to cook the beef etc? Oh Em Gee! As I eat this for lunch (I couldn’t wait till tea!) I feel like I’m back at the Fishermans Wharf in San Francisco! Best chilli beef out of the USA! I’d love to serve this up on a Cobb loaf (SF style) – so will leave mc off and cook a further 5 mins to reduce liquid! Hello. Thanks for the great recipe. Just wondering why you place the mince in the Varomer to start instead of putting it straight in the bowl with the beans? Hi Peta, with the beans and the tomatoes there isn’t enough room in the bowl for the mince too! The recipe can be halved if you wish and then it will fit in the bowl. I hope you enjoy it. This recipe is made twice a month at our house and sometimes by the kids. It’s great! We tried it with 1 tin of red beans and 1 tin of corn Kernals which was a nice alternative too. We line up the Chilli Beef and all the other Nachos condiments and let them concoct their own version. Thanks for a great recipe. This is a regular at our dinner table and is so popular that I make up batches to freeze for when I don’t want to cook and need a quick meal. I agree a batch in the freezer at all times. Really enjoyed this! Think it would be great in a wrap with tomato, spinach, cheese, sour cream etc.